FON is the first private university in the Republic of Macedonia, established in 2003. It is one of the biggest universities in the Balkans. It is an institution following the current world trends in education and one which has build its reputation upon the solid grounds of the best educational staff, both from Macedonia and abroad, following the latest methods and techniques in education. Every young person rightfully asks itself how to attain its intended academic degree and how to gain the knowledge, the level of education and the qualifications that would guarantee a successful professional career. Following the latest trends in higher education, FON University is a gate through which you can step into the society, ready to face the challenges of the modern business world. 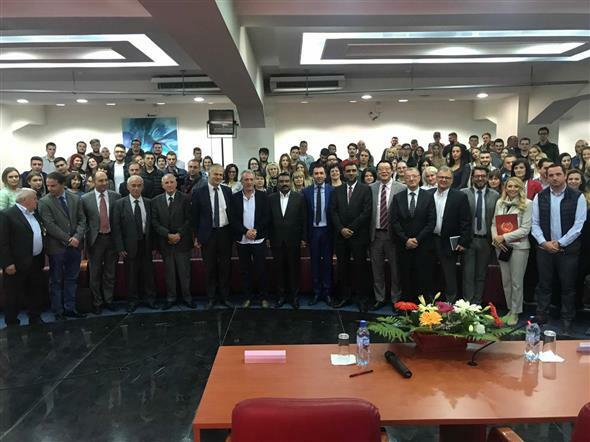 Given the fact that choosing a faculty is one of the most important decisions in a person’s life, FON University is oriented toward helping each individual achieve their academic goal. Our determination is to offer a full product, where the student will not only receive the academic training and knowledge but will also develop the skills and qualities necessary for easier employment and that will prepare him/her for taking his/her place within the society. Our goal is to create true professionals, who will be prepared to embark upon all challenges of the business world. Over the years, we have managed to prove the quality of our institution and gain the trust of the young population, all the while building the brand and the tradition known as FON University. The time spent at the university is the time when you invest in your future. Your academic engagement and active participation in the educational process will help you develop your intellect. FON University offers you the means to prepare for your chosen career. The student activities are going to broaden your intellectual and business horizon. The possibilities for interaction, practical work, socializing, debates and workshops, various projects, student publications and even the parties together with all other aspects of the student life will enable you to develop your talents and discover some new ones. Very important for us is that students receive not just formal knowledge but also an informal supplement to their CV, through a series of trainings in our country and the possibility to participate in over 300 conferences and seminars in more than 42 European countries. From 2017, Dr. Thanabalan J. and YIDA Construction, became International Executive Capital Partner at the University, providing internationalisation of the University and development of new academic programs, construction of a University Hospital and University Housing City, thus attracting over 10,000 students from more than 40 countries worldwide. The studies are conducted in compliance with the principle of the Bologna Process and European Credit Transfer System. High quality lectures in compliance with the newest methodology tendencies. Choose the right faculty! FON is your ultimate choice.